Samsung has announced its sixth phone in the Galaxy A series, the Galaxy A70 in India on Wednesday. It has one of the biggest display Samsung has ever put on any smartphone, is powered by a huge battery and is the first phone in the series to feature 25W fast charging. The A70 is also the first phone in the series to support Samsung Pay. Samsung has priced the Galaxy A70 at Rs 28,990 with pre-bookings starting from April 20. The phone goes on sale for the first time in India on May 1 and will be available in three colours- white, blue and black. As part of the launch offer, Samsung is bundling the Galaxy A70 with U Flex neckband headphones for an additional Rs 999. Samsung’s U Flex Bluetooth earphone usually retails for Rs 3,799 in India. The Galaxy A70 will be available on Samsung India Store, Samsung Opera House in addition to Flipkart. With a Full HD+ (2400 x 1080 pixels) resolution, the Super AMOLED screen on the Galaxy A70 measures 6.7-inch in size. There’s a u-shaped waterdrop notch on the front which houses a 32MP selfie camera having an f/2.0 aperture. The display is also embedded with an optical fingerprint reader. 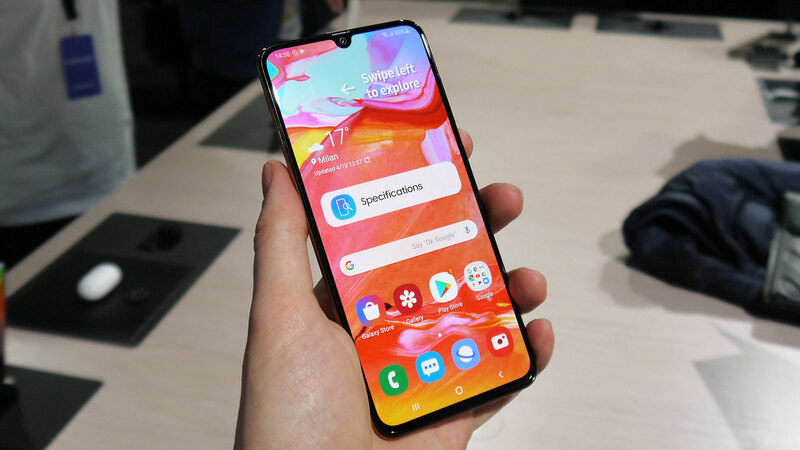 As opposed to the other phones in the A series powered by Exynos chipsets, the Galaxy A70 runs on Qualcomm Snapdragon 675 processor with an octa-core CPU. This is paired with 6GB of RAM and 128GB internal storage. Users have the option to bump up the storage by upto 512GB via microSD card. The phone runs on Samsung One UI over Android 9.0 Pie. The A70 has a triple camera setup consisting of a primary 32MP camera with an f/1.7 aperture backed by a 5MP depth sensor which assists in creating pictures with depth of field. The third sensor is an 8MP ultra-wide sensor with an aperture of f/2.2. The rear cameras support features like slow motion and wide-angle video recording while the front camera can be used with AR-Emoji to create fun looking pictures and videos. It has a battery capacity measuring 4,500mAh and supports 25W fast charging which is a first for the A series.